We’ve been going through a set of string lights every year or so, leaving them up year around on the porch. If you look at some of the older photos, you can see them not on the porch, but running along the top of the raised beds. 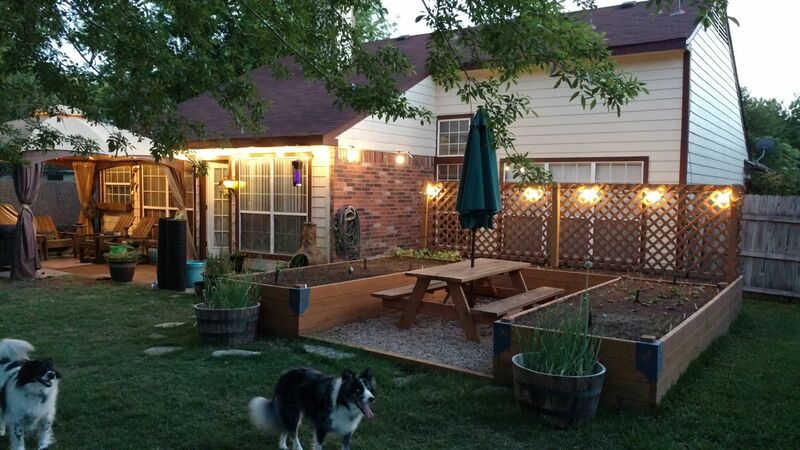 The last set we purchased was incandescent bulbs, and ran somewhere around $40 at Target. 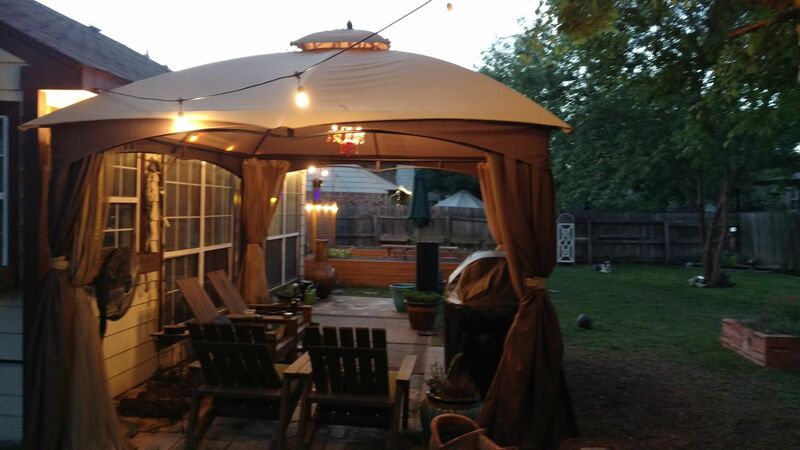 They weren’t the best quality, but the majority of the money seemed to be in the bulbs from what I can tell pricing out replacements from the manufacturer, and the bulbs were burning out left and right. As we also needed some electrical in the greenhouse, and we’ve been running our lights off a light socket to electrical adapter on our porch light (which I don’t really trust, causing us to keep a very watchful eye on them) I wanted to move away from, so I hit up Amazon for options. 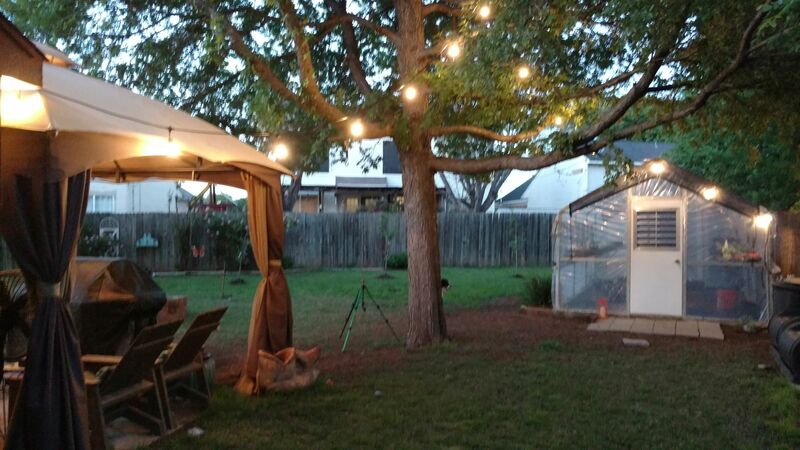 I found some nice looking 48′ “commercial” string lights with 2w LED bulbs. They were pricier, but if they last a lot longer, as they should if better quality wiring and with LED bulbs, it is worth it. We ordered two sets last night, and they arrived this afternoon. We also grabbed a cheap dusk-to-dawn timer, mainly for the wireless remote. I decided to string them across the house, over the tree and to the greenhouse, and since they’re much heavier (14AWG extension cord material), that gives us electrical at the greenhouse. On the other side, I ran them from the house down to the lattice and across to the end of the raised beds. I only had a few feet left over from the 96′ of lighting. Below is the view of the string going from the house, through the tree, to the greenhouse. Plenty of clearance over my head, and I’m 6′ tall. From a similar location, but viewing down the porch. This is from the other corner of the yard, where you can see how they turned out on the raised beds and along the house. There was no way to make the wiring look nice, but I bundled it up best I could and will find something to cover it. The timer, all the cords, and a dimmer switch. 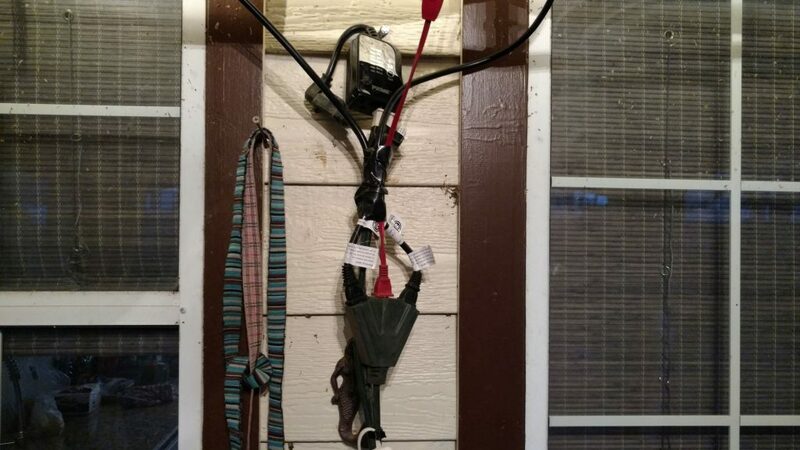 I threw the dimmer in there to mess around with, and won’t be running any electrical devices off the connection at the greenhouse with it in there. However, since the electrical at the greenhouse was primarily for lighting, it may work out. I’m going to look on Amazon for a heavier duty/outdoor dimmer. At least it’s well protected for now, where it is located. 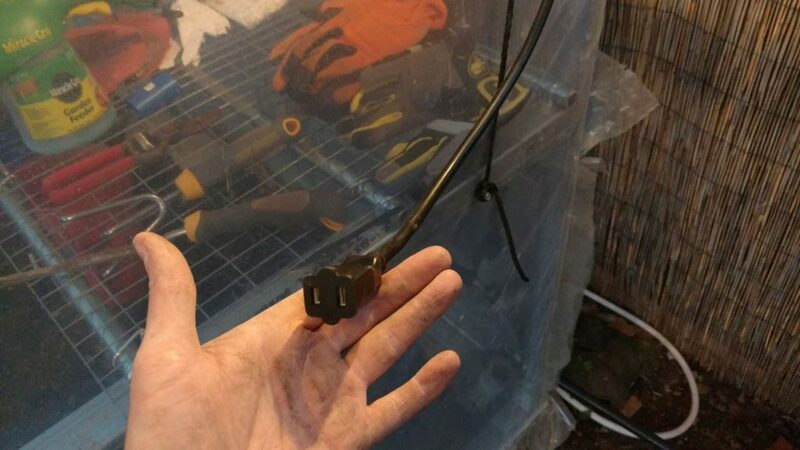 This is the electrical connection at the greenhouse, and gives a better idea of the wiring used in this set. 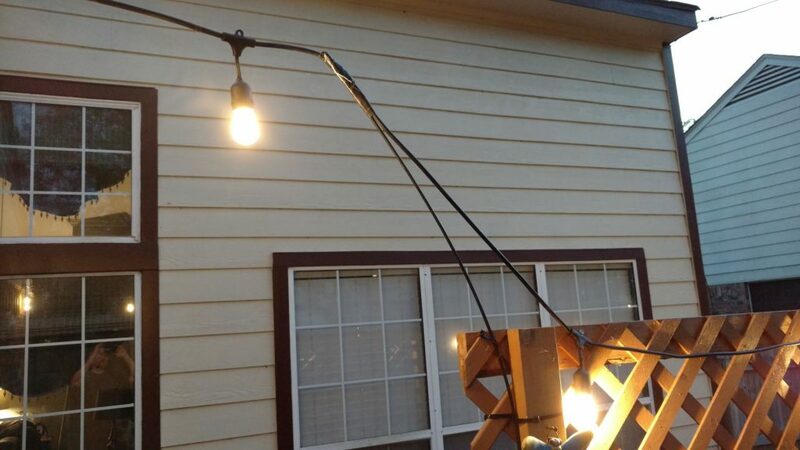 The supply comes from the outdoor outlet rather than the bulb socket adapter, which was only rated for 500w and had quite a few strands and a bug light running off of it. 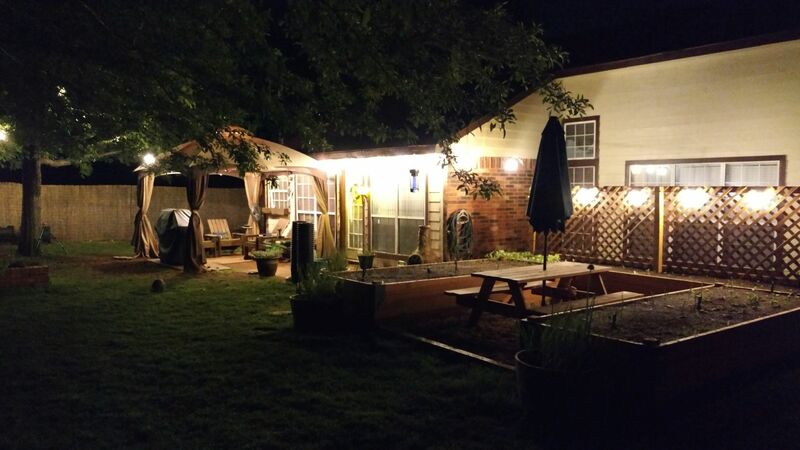 Also, the stretch jumping from the raised beds to the house was too low to walk under, so I found a 6′ fiberglass pole left over from another project, zip tied it with heavy duty outdoor ties to the lattice, and used gorilla tape to attach the string to it so it could offer support. Seems to work well and raised it an extra couple feet off the ground. Finally, a photo of it after dark. Taken at near-full brightness on the dimmer.